I've been caught up in Maple Syrup season and migration here at home so I'm a bit behind in the last installment about my trip to Arizona. Just a few pictures here. We spend the morning at the Botanical Garden and I squeezed in some birding. 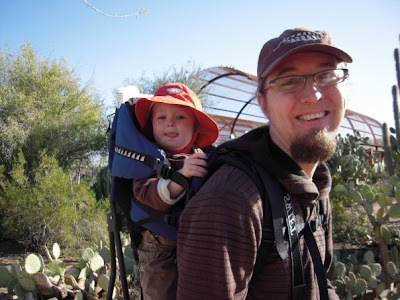 It was interesting to try to ID birds with a toddler bouncing on my back like he was riding a horse. The botanical garden was pretty much all cactus so letting him romp around free was not really an option. 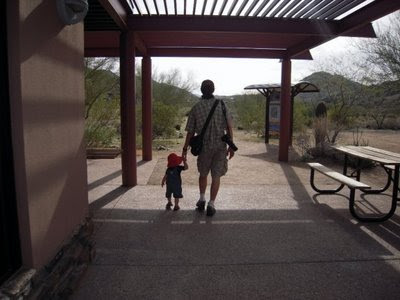 I was able to let him walk around more when we visited the Environmental Learning Center at South Mountain. I gotta say, this is pretty sweet. The next generation of birders is born. He loves to point out birds in the sky. The only new bird for the year was a Gila Woodpecker. I'd seen them before on previous trips to Arizona but got a really nice view this time. Of course, the very next day one showed up in a tree near the pool where we were staying. I had to include this photo as well. 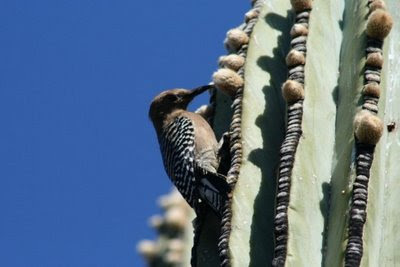 This is the same cactus that the above Gila woodpecker was making a nest hole in. Sure enough, that's a starling. I have to say though, it was beautiful in the sunlight. I also saw a blue-gray gnatcatcher that I really wanted to turn into a lifer black-tailed gnatcatcher. I didn't get a good view of the underside of the tail but the top seemed to have too little white showing to be the black-tailed. On our last day we were poking around the condo when my mother (they were gracious enough to let us stay with them) said that one of the ducks on the golf course looked funny. I took a look out the window and sure enough it was an American Wigeon. It was the sole wigeon hanging out with some mallards. That pretty much wraps up the Arizona birding. This was my third or fourth time in Arizona and I still didn't see a road runner. I am the coyote.